This exclusive tartan commemorates the 250th anniversary of the Society. It has been designed in Scotland by Kinloch Anderson, foremost experts in tartans and Highland Dress since 1868, and is registered in The Scottish Register of Tartans. Since its initiation in 1761 the Society has had three locations Wrights houses at Bruntsfield Links, Musselburgh Links and Barnton. The name Wright belongs to the MacIntyre Clan, Musselburgh has its own Musselburgh tartan and Sir James Maitland was the Barnton landowner in 1898. 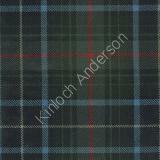 Elements of these three tartans therefore feature in this tartan. The sett is based on the MacIntyre tartan, the light blue is taken from the Musselburgh tartan and the strong overcheck taken from the Maitland tartan. Additionally every colour has its own significance: green and red are taken from the Societys logo and green reflects the golf course itself, the deep blue represents the view over the Firth of Forth and soft yellow the bunker sand.